JPMorgan Healthcare Conference 2015: 33 Years Later We're Still Searching... | It's all about the triple aim. It looks like this will be the third year in a row that I participate albeit via 2nd level engagement ‘touch points’ in the proceedings principally via side bar event or private party invite [or crashing], the rich twitter stream and a most generous schedule of webcasted company presentations. To follow the free JPM 2015 webcasts you can register here (simple email registration is required). As someone trained in the behavioral sciences and public health or its more contemporary version framed as ‘population health’ where the focus is on the health and wellbeing of whole populations, I rarely follow niche biotech, pharma or medical device investment themes per se. 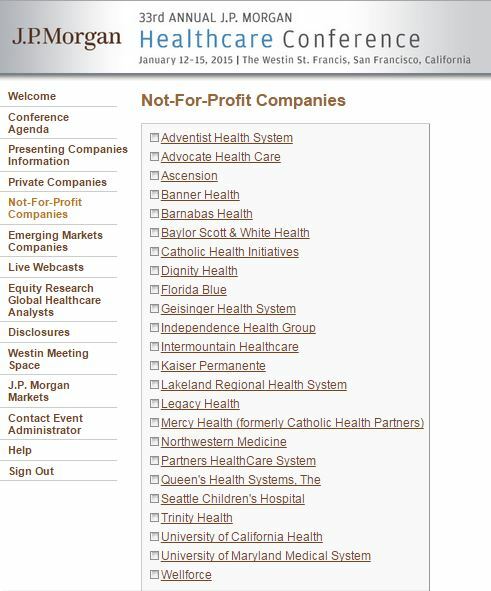 Rather, I am singularly interested in monitoring the vision, strategy initiatives and outcomes reported by a rather heterogeneous cohort otherwise grouped by JP Morgan under a ‘non profit companies’ track – mostly tax exempt health [hospital] systems. While many of these entities may be virtually indistinguishable from the for-profit brethren, how they organize, partner, joint venture or chose to extend beyond their core businesses [or not] is always a fascinating story. Further, as ‘uptake gatekeepers’ if not the customer for many of the innovations presented by participating companies at JPM15, measuring their sentiment or ‘buy-in’ is one way to gage the likely relevance of the product, service, platform or ‘IP’. Following the passage of the Affordable Care Act it’s fair to say that we’re in the midst (albeit early) of a fundamental restructuring of an arguably $3 trillion ‘cottage industry.’ Seeded originally under the pillars of ‘cost plus’ for hospitals and ‘usual, customary and prevailing’ charges for physicians we created a supply driven perfect storm of a silo-ed healthcare [non] systems incentivized or perhaps addicted to more. Where do more meant, earn more. That is now changing and everyone agrees that ‘business as usual’ is no longer an option. The question is what is the footprint of these new, emerging or re-tooled business models and who are the value added partners that enable the expression of ‘new term sheet’ success at scale? With that in mind, I reviewed the line-up for this year and note the following partial list of companies reporting in the non-profit track. Be mindful that for these links to work you must register before opening them. There is a contextual story (provider type, market characteristics, risk tolerance and prevailing culture) to each of their reporting. For example, I am most interested in the post merger vision of Baylor and Scott and White, where a group practice medical group centered IDN has affiliated with a more traditional albeit progressive hospital system. Who’s cultural DNA will prevail post merger? Also, the twitter hashtag is #JPM15. Follow the dashboard here and follow me on twitter via @2healthguru.